Group Discussion Ideas > Social GD Topics > Population explosion – boon or bane? Population explosion – boon or bane? Population growth provides us with a more number of working population, which is needed nowadays for speed progress. India’s population is termed as a young population as the average age of Indian population is around 25-26 years, which is considered as productive age. This kind of population can help the economy to grow. Greater population means more consumers for industries. So many industries focus on the countries having large population to sell their products. This leads to competition and eventually fall in the prices of many things. Larger population provides a great manpower. If this manpower is utilized efficiently in different sectors , it can lead the country towards prosperity. Population explosion also provides us with people of multiple talents in the fields such as sports, music, art etc. If a country invests well on human resources and provides enough opportunities to the people, it can come up with vast pool of talented people. If the number of working population is greater than kids and elders, they can support them. This will reduce the dependency rate. As the dependency rate decreases, savings will increase, so are the investments. This will result in hike in the productivity, which will ultimately help the economy grow. In the European countries which have been experiencing zero or negative population growth, people are offered incentives to encourage them to have more children in order to increase their population as their economy is in shambles. This shows that we can not overlook the potential of a big number. The increase in population puts a pressure on the several resources that we have. This leads to the overall shortage in land, jobs, capital, housing, and health services. Rapid population explosion has led to the over exploitation of the natural resources and degradation of environment. Environment degradation has resulted in many natural calamities that rarely happened earlier. It has also fastened global warming. Human actions are increasing it even more, deteriorating the situation. For a huge population, it becomes more difficult to provide the facilities so basic such as water, health etc. Even if provided somehow, then the quality of the facilities decreases. For feeding a large population, we need more production of food. Even though new techniques of agriculture have manifold our productions many times, there is still malnutrition reported in the developing and poor countries. Poverty is one of the reasons why people couldn’t get enough resources for themselves. Not having enough money takes a considerable toll on the availability of services. When the population is large, there are employment issues. Many people have the necessary qualifications but there are not enough jobs for them. Many people turn towards the illegal activities due to unemployment and poverty, which leads to the waste of manpower, both in illegal activities and in keeping these in check. Population explosion ultimately leads to the decrease in per-capita income and standard of living of the people. A large population makes efficient management a burdensome task. If not managed properly, achieving the sustainable development would become a dream for us. 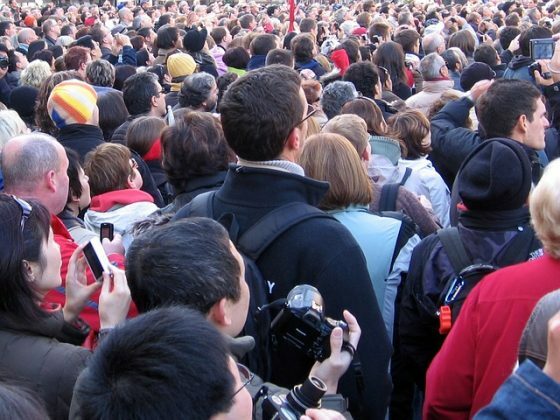 Population explosion is the sudden increase in the numbers of individuals in a community. Lately we have been facing population explosion in many countries of the world. In the past 200-300 years, the world’s population has increased tremendously. It is predicted that human population will increase by 1 billion in the next decade. Population explosion results mainly due to difference between birth rates and death rates. Whereas many people look at the population explosion as a problem or have negative perspective about it, several people also look at it as an huge opportunity for a nation to achieve it’s ambitions. While the population explosion can give us many opportunities for development, it also takes a toll on our resources. This results in the degradation of the quality of living. The quality of a undernourished, poverty stricken, unhealthy but big society is definitely lower than a smaller but healthy, educated, economically secured, and well employed society. The population can be our strength only when we have resources and power to feed, provide the basic facilities, health care and jobs. This will mould them into an asset. But in reality, we don’t have the necessary resources to do this. So we must put our efforts into the prevention of further increase of the population. We need to strike a balance between the quality and quantity. Afterwords :- What’s your opinion on population explosion? Feel free to express your thoughts on this topic in the comments section below. Yes , I think population is a bane because we see our sournding there were a lots of problem like global warming by cutting the tree , and so much garbage in our sourndig, etc. It is not disputed that Global Warming has severe and will see increasing deadly effects throughout the entire world. Problem: ALL of the major solutions proposed will never be fully implemented, would not be effective enough, are uncoordinated and not enforceable. They simply are not and will not work. Only Solution Possible: Each country must take full responsibly for all of its actions including Global Warming. The human population for every country must be reduced to one that is in proportion to its size and natural resources by each Government, or it will be reduced by natural disasters. China is the only country that has limited and had some control over it’s human population, but every country has to set population goals as the very first step to solving Global Warming as well as the destruction of every other animal and plant species present on earth. Estimate: USA need to reduce it’s population gradually by 50% over the next 50 years, whereas some countries would need much larger reductions in population sizes. When this does not happen (as no-one in government even publicly raises this possibility), tragic and unnecessary human suffering will instead take place. According to me population explosion -bane , thousands and thousands populations are increasing day by day as a result of scarcity of land .As per demand people wants to build high-rise building causes of deforestation , trees are hacked to death and we everybody suffering for global warming and pollution etc . People they build house and they required water there is no limit they are using the ground water . From research study found by 2050 the day will come people will not get ground water. Secondly populations are increasing as a result of huge demand essential commodities are prise hiking everyday , production is less in comparison to demand. Thirdly creates unemployment , educated people they are not getting job because vacancy is limited . We everybody aware petrol prices are hiking everyday because of huge demand populations are increasing and vehicles are increasing. Somebody wants to run a business there is also competition he will not be able to compete with others . Everywhere the problem , somebody ill he has to to hospital there is also no seat after sometime we will reach our population in billion.